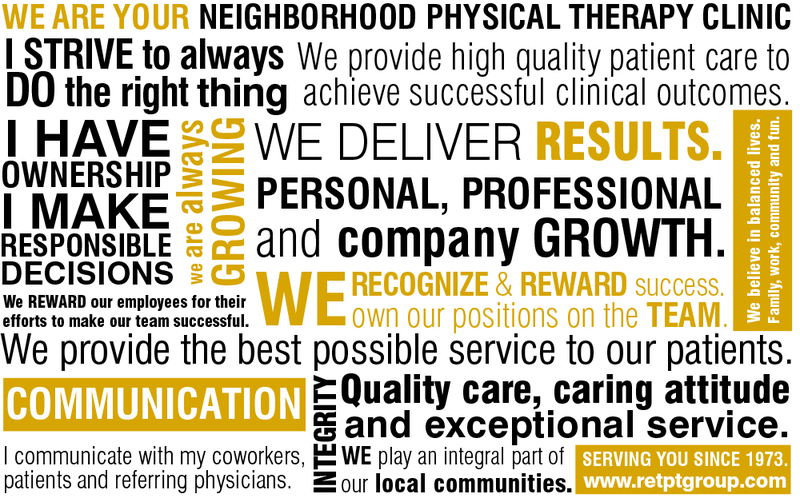 RET Physical Therapy Group was founded in 1973 by Robert E. Tutland, PT. Each of our locations are locally owned and operated by a team of physical therapists. Our point and purposes are simple; to create neighborhood, service oriented clinics with highly skilled staff to deliver excellent care and customer service. For consistency and quality of patient care, it is our goal to retain valuable employees through support, recognition, and a commitment to balanced personal and professional lives. We believe in a balance of family, work, community and fun. Our goal is to continue to grow and meet the demands and needs of each neighborhood we take pride in serving. We have an extremely dedicated and loyal staff of therapists and support staff to ensure that you receive quality care and an excellent experience. Let us help guide you to a healthy, long term solution.